Are you dreaming, planting, and tending visions of a queer ecological future? Are you looking to connect with kindred spirits in your region and across the country to share resources to support these visions of collective liberation? 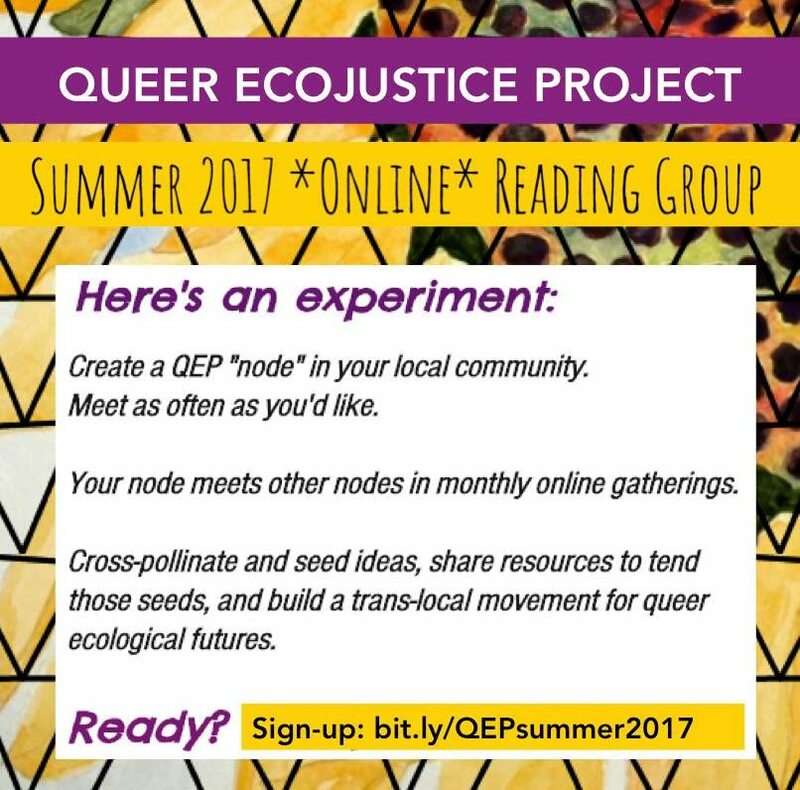 Join Queer Ecojustice Project for our first ONLINE reading community! Most gatherings will be local in your region (we call these regional groups, “nodes”). Monthly online community gatherings will occur in June, July, August, and September. Read on below for more information about the organizers, facilitators, QTPOC reading group nodes in Oakland and Seattle, and QTPOC community land projects that need your support. Queer Ecojustice Project organizes at the intersection of ecological justice and queer liberation. We are catalyzing culture, consciousness, and community around our collective concerns and building coalition across difference. Roya is a queer mixed race geographer and climate justice organizer whose work focuses on direct community resistance and resilience at the intersections of decolonization and ecological justice. Do you have ideas about how we should do this? Are you deep in this world and want to share your experiences with others? Are you working with QTBIPOC movers and shakers who are growing inspiring futures, and want a platform to help amplify those stories? If so, please check the “facilitator” box on the sign-up form, and please take this doodle for our first meeting! We will contact you to schedule some time to talk. Or, you can also email us directly at queerecoproject@gmail.com. Please note: We prioritize leadership from the people who are most impacted by the cisnormative, white supremacist, capitalist, ableist, settler-colonial heteropatriarchy system that is also the root of ecological degradation. As such, people of color, two-spirit, undocuqueer, trans, gender non-conforming, and folks with disabilities are centered, highly respected, and looked to for leadership. Oakland: Join the QTPOC “Weeding and Reading” group. If you are interested in joining these conversations and building connections with other Bay Area QTPOC community, reach out to Desi for more information about time & location of the next meeting: dfonteno@gmail.com. If you live in Seattle, Olympia, or Bellingham, and want to build QTPOC ecojustice community and get connected with others interested in forming a node, contact Roya at kinnikinnick@protonmail.com.